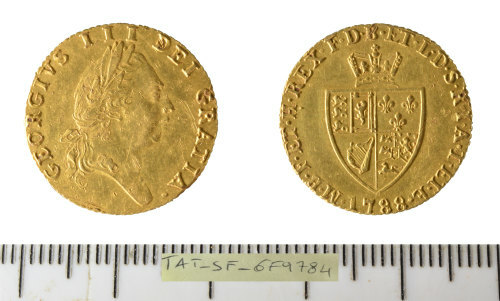 A gold Post Medieval Half Guinea of king George III (AD 1760-1820), dated to AD 1788. Cf Seaby (1976, p. 205, no. 2962). Obverse description: Fifth laureate head right. Reverse description: Crowned quartered spade shaped shield of arms. Reverse inscription: M.B.F.ET.H. REX. F.D.B. ET.L.D.S.R.I.A.T ET.E.